Telus has recently provided a statement to the Take the Giant Screen Down Now organisation which effectively declares that continued assault of local residents by Telus advertising on the giant video screen at Terry Fox Plaza until whatever random hour on major event nights is acceptable and that a continuation of operating hours well past sundown on all other nights is ‘issue solved’. This concept that a reduction of operating hours on some nights ‘solves the issue’ is ill-formed as it suggests that continued harassment of this community and disregard for City by-laws is perfectly acceptable so long as it's not perpetuated all of the time. With mounting public pressure and increasing scrutiny by public officials into PavCo’s questionable methods, there is little doubt that the giant video screen at Terry Fox Plaza will soon be taken down. Once removed, and once the bad apples at PavCo have been purged from the organisation, which side of civic history will Telus be on? Will it be A) supporting community values and social responsibility, or will it be B) financing the disruption and harassment of our glass residential neighbourhood? Shawn Hall of Telus has advised our group that Telus is "satisfied that the issue has been solved" and that continuous blasting of your ads into our glass homes on main event nights is considered acceptable by Telus. 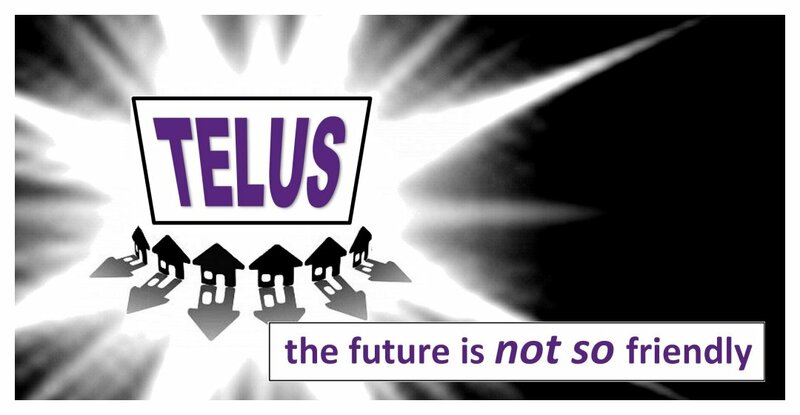 Given Telus' supposed commitment to community values and social responsibility, might you wish to reconsider this position? More importantly, might you want to reconsider your branding of the BC Place Stadium altogether? 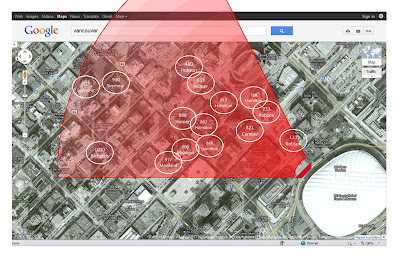 This issue is quickly going to transition from a PavCo problem into a huge Telus brand equity problem. Please respond. We are referring to your incessant Telus advertising appearing on a giant video screen disrupting an entire community. 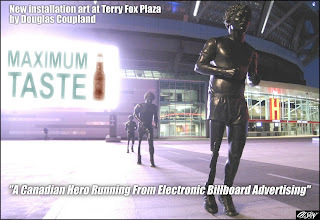 Although Telus does not own the screen at Terry Fox Plaza, it is YOUR advertising which is assaulting us in our glass homes. We are certain that your investors and your marketing team will be very concerned about your firm’s brand equity in a sensitive case like this. Do not miss this opportunity to inform your teams of this quickly escalating and potentially explosive issue. Our group will soon begin exposing advertisers as ‘enablers’ of the giant screen (through your ad revenue support) and will start shaming those companies publicly. We thought it would be fair to advise your company of this first so that you could act responsibly and pull your advertising from this screen. How would you feel if someone stuck a giant spotlight in front of your home? This next column by Geoff Olson (part-1 of 2) really captures the extent of the despicable situation which PavCo has recklessly created for residents of this neighbourhood. Keep your eyes peeled for part-2 of Geoff Olson’s coverage of this story in next week’s paper or check back on this blog for the post. Here's an important letter to the editor about how PavCo's contempt for downtown residents will not be tolerated. Please do not ease off your letter writing; this is far from over. ﻿Interesting fact: Did anyone notice that for both live radio interviews where I shared the mic with PavCo (first on Rick Cluff, and then here during my second show with Bill Good), Warren Buckley didn't even have the courtesy to show up on time to hear my complaints? Both times he simply called in, came on the radio, admitted to both radio anchors that he hadn't listened to me at all (I went first both times), and then delivered the pre-packaged company line. So much for being sensitive to residents' concerns. 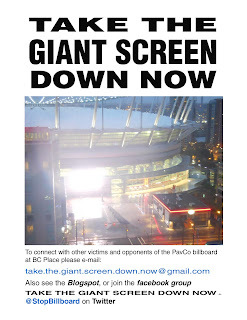 **Update on this previous post**: If you’re interested in contacting officials to complain about how the giant screen is disrupting your home life or that of other residents, please refer instead to the post on this blog entitled ‘PavCo Minister says that breaking Vancouver City By-laws is a successful conclusion‘ – There are new suggestions in that post which might simplify your task and also help unify our message. Please take 20 minutes: It is important that all concerned residents take time to write at least one letter of complaint this week (if you can, also send copies to all those others listed above). Our collective message is that they must Take the Giant Screen Down Now (along with an explanation of how it’s negatively affecting your life at home, or that of other residents). Emails and phone calls are also good, but when contacting provincial agencies, mailed letters are provided the highest level of attention. Thanks for working together and doing your part. We are all members of this community, we have a right to a peaceful and enjoyable life (even downtown! ), and taking individual action as part of this collective group is a very powerful thing. 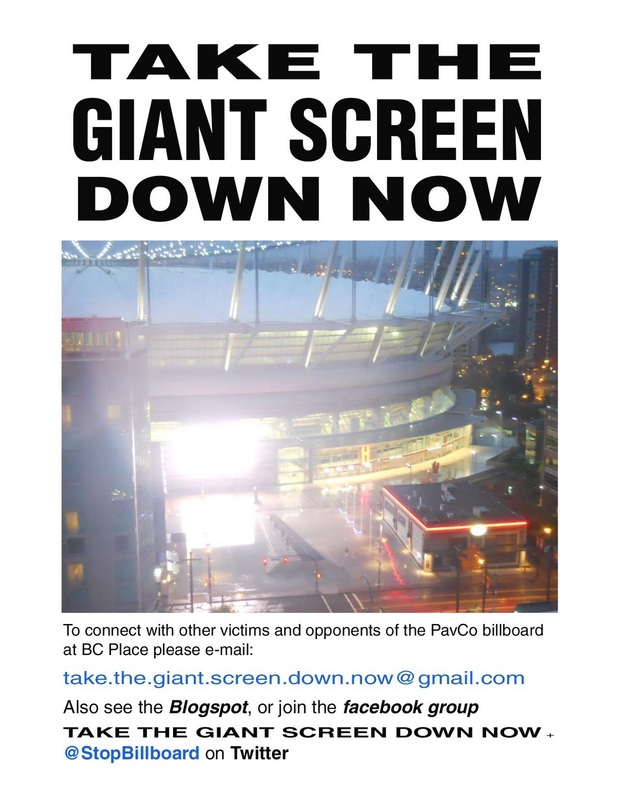 This Blog is an openly accessible informational bulletin board for Vancouver residents who are concerned or discontent (many are outraged) about the highly adverse impacts of the new Giant Flashing High-powered Advertisement Video Screen erected by PavCo in front of hundreds of residential glass homes at Terry Fox Plaza at BC Place Stadium. Please consider visiting the publicly-accessible Facebook PAGE ‘Take the Giant Screen Down Now’ for more information about this unbelievable situation, or consider joining the Facebook GROUP (same name) to connect with others and contribute to the organised protest against this intolerable Giant Video Screen.